My husband & I just got married & we had the wedding of our dreams! Everything was perfect, the venue, the weather, the day - everything! But my favorite thing was my video. I knew when I met with White Diamond they were the right videographers for us. We felt so comfortable meeting with them (I had a previous bad experience with a video guy so I was a bit leery) but they were great. They promised me they would be early & that they would get every shot I wanted and they delivered. We enjoyed the highlights recap too. We met with a lot of video companies (I am pretty much a perfectionist when it comes to planning events) so it's hard for me to put something as huge as my wedding into the hands of other people but White Diamond was great. I can't say enough positive things about Stefan and White Diamond Video. They were an absolute dream to work with from start to finish. They are true professionals in every sense of the word and you can tell by the finished product and by how great they were on the day of the wedding that they honestly CARE so much about their work and making sure every bride and groom has the very best keepsake to remember their special day. Before my wedding, I consulted with Stefan about all the special details I wanted to make sure he captured in video. He was so receptive and asked thoughtful questions showing he really cared about delivering the perfect results. When I saw the highlight reel I was blown away. Not only had he captured those details, he did so in exquisite and breathtaking fashion! His artistic eye is amazing and the highlights reel truly portrayed the essence of our wedding in a way I could never even have imagined. On the day of our wedding, Stefan and his crew were so great. They were easy to work with, gave great direction for some truly spectacular shots and weren't at all pushy or intrusive. I have already watched the highlight reel about 100 times and cannot wait for the full video. I am already picturing showing it to my future children. With respect to value, we had a small budget for video and I searched far and wide for a reputable cinematographer who would not only do a wonderful job but could do so for a reasonable fee. I cannot stress enough that not only is White Diamond truly amazing in what they do and ahead of their class, but their fees are significantly lower in comparison to other vendors who, in my opinion, don't even produce the quality of work that White Diamond does but somehow feel like they're entitled to charge upwards of $5,000 and act like they know better than you what you want for your own wedding. If you want a cinematographer who listens, cares, is a true professional, won't rob you blind, and will capture all the wonderful and genuine moments of your wedding and translate them into a beautiful and timeless memory, go with Stefan and White Diamond. It will be one of the best decisions you will make in planning your wedding! OMG! Our wedding video was so creative! 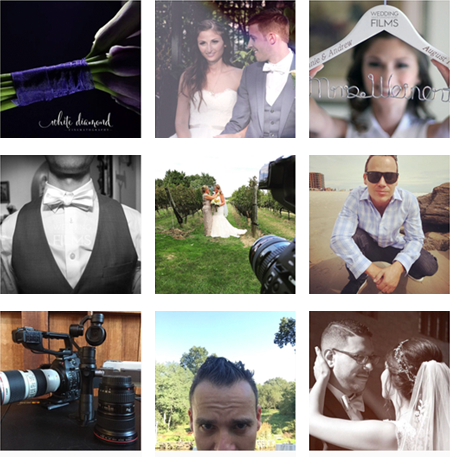 We LOVE our weddding video! White Diamond Video did a fabulous job! Everone who sees it is very impressed. The shots, the music, the creativity is amazing! So happy with White Diamond, and our treasured memories of our spcial day! I got married recently & it was a complete dream! Our favorite thing was our video! We have watched it over and over and we simply can't get enough. The staff at White Diamond promised me they would be early - they were and that they would get every shot I wanted - plus some I didn't know I wanted :-) We were so happy with the professionalism and creativity and they provided. We met with over 6 video service providers and I am very happy we chose White Diamond. I know we will be watching and enjoying our video for years to come. I HIGHLY recommend hiring White Diamond Video for your wedding. They're trustworthy, reliable and put out a beautiful product. Stefan and his team at White Diamond Video did an amazing job for our wedding. Not only did they provide a very reasonable price but they delivered beautiful DVD's with our photos on the packaging and the video itself was perfectly edited. We definitely recommend White Diamond Video!!" My husband and I used White Diamond Video for our wedding on July 12th, 2014. I can't say enough good things about them! The owner, Stefan, was so great to work with; he told me he would be there at 11:00, and he was there at 10:45. He stayed literally to the very end of the wedding, not just until after the cake is cut like another videographer I met with. Not only was he extremely professional, but lots of fun too--we had a blast all day together! I felt like we were all buddies by the end of the day. I haven't gotten my entire video back yet; Stefan's package offers a montage of your honeymoon pictures which we haven't gone on yet...however, he did send me our highlight reel set to one of the songs I requested. The highlight reel was absolutely beautiful, I teared up the first time I watched it--the first of like, 30 times that is, because I can't get enough of it. I can't wait to see our whole video. All in all, I couldn't be happier with Stefan and White Diamond Video. I have recommended them to my engaged friends, and would recommend them to any bride and groom. Very Happy With White Diamond Video! My husband and I worked with the owner, Stefan, who was very professional and arrived early to our initial meeting and early on our wedding day too. He gave us a great price for our wedding video package and as we were on a very tight budget, he offered to film and deliver the raw footage to us by the time we returned from our honeymoon. I've only been back for a week but I have watched the entire raw footage, twice! I would greatly recommend White Diamond Video to any bride thinking of having a cinematic take on your wedding. He and his lighting assistant Andy were extremely invisible during the day, my guests did not feel awkward with a wedding video cameraman with large, bright lights as his cameras are apparently high-tech and only need minimum lighting. The vows were crisp, the shots were cinematic and dramatic and we will be using him for our children's wedding in 20+ years ! Thank you White Diamond Video for all your hard work. My husband and I were married at the Carlyle on the Green in May of 2014. We chose the basic package offered by White Diamond Video and booked Stefan, the owner, a few months prior to the event. Stefan was prompt with his e-mails and correspondence leading up to the wedding, which all brides can appreciate, and he checked in with me the week of the wedding to review the itinerary. On our wedding day, Stefan arrived promptly and worked the video seamlessly into the busyness of the photography session we were currently shooting. He worked well with our photographer and captured many beautiful moments during that time. Stefan was excellent at being involved and present during the evening, yet discreet, unobtrusive, and professional in his work. We enjoyed working with Stefan, and are happy he captured our special day. The highlights were the best! The highlight reel was the best thing about the package. I was looking forward to watching the short 5 minute clip of my wedding than the entire video. Who has time for that anymore? Also a really great way to share the event with your wedding guest in addition to those who weren't able to attend. The DVD was professionally and beautifully packaged and I received it before the expected date. From our initial sit down, to the finalizing of our wedding video, White Diamond was an excellent company to work with. Stefan and his partner were the definition of professionalism. They worked with us to help us create a personalized, unique wedding video that we will enjoy for decades to come. They were extremely timely in returning to us our highlight reel and wedding video. When we required a minor change, they did so with no issues. On the day of the wedding, Stefan showed up with brand new, top quality video equipment that made the groom extremely pleased. We can not recommend White Diamond enough. Thank you Stefan! White Diamond video exceeded our expectations! From the very first meeting, Stefan was very professional and prepared to answer all of our questions. He came highly recommended and it’s clear why. He was so open to our creative ideas. He was very easy to work with and always got back to us right away with answers to our questions. Before the wedding he confirmed all the details and special effects that we requested which really put us at ease. He showed up early the morning of and that’s really the only time we noticed him. While taking photos, he requested some really creative shots but the rest of the day he was so non-intrusive that we forgot he was filming! We got our highlight reel very quickly and it was beyond what we were expecting. We absolutely loved it! After receiving the full video (and watching it many times) we are so happy to have such a special video of our day that captured every detail and did it in such a creative way. It really came out more like a movie than a wedding video, which is exactly what we were hoping for. We asked him to incorporate a vintage super 8 feel to the movie and it came out so great! He incorporated our theme in all of the creative shots, which really tied the whole movie together. We highly recommend White Diamond video to anyone looking for a professional and creative videographer who truly captures a couple’s personality, and does it for a reasonable price. Thank you to Stefan for creating a beautiful video that will allow us to relive all those wonderful memories from our wedding, we couldn't have asked for more! I was on the fence about hiring a videographer and from day 1 Stefan at White Diamond video put my worries at ease. He was very professional and friendly. On our wedding day, I barely noticed him. He was very unobtrusive. In fact there were things I worried he missed bc I didn't even realize he was filming, but when I got my video he caught everything. He listened to what I wanted and made sure to include everything I asked for. He even threw in a couple of extras. There's one part in the video where he has my husbands wedding band slide into my ring. It's sooo beautiful. I felt he went above and beyond what I was expecting. I am sooo happy with our final video and highlight reel. I highly recommend him! You won't be disappointed! ! ! White Diamond Video is truly amazing!! They made our day very special by being kind, patient and extremely professional. The video they provide is movie quality, we continue to get compliments on it months later.. They also worked very well with our photographer. I would definitely use them for future occasions and would recommend any bride to use them for your big day!! Passion for their work you can see!!! We worked directly with the owner, Stefan, what personally puts his all into the videos. He was very professional from Day 1. He worked with our budget and even adjusted his packages to accommodate our needs. He even contacted me for invitation and playlist in January which told me he was preparing in advance and not taking it lightly. And he contacted a few days before our wedding day to make sure he had the most up to date info. He made me feel comfortable entrusting him with such a big responsibility. On our wedding day de was on time. He was not intrusive at all. He got the footage he needed without getting in our way. Stefan is AMAZING I highly recommend White Diamond Video!!! Perfect quality at an affordable price!!! The best vendor I booked for my wedding was white diamond video without a doubt. Stefan was amazing. He really listened to what we wanted and went above and beyond. The end product is nothing less than perfect. I've seen a lot of wedding videos... and I could not be happier with how unique and modern ours came out! Thank you for capturing the best memories of our wedding! We are really glad we went with White Diamond Video. Originally we weren't sure we were going to have video, however we changed our mind as Stefan gave us a fair price and was easy to work with. 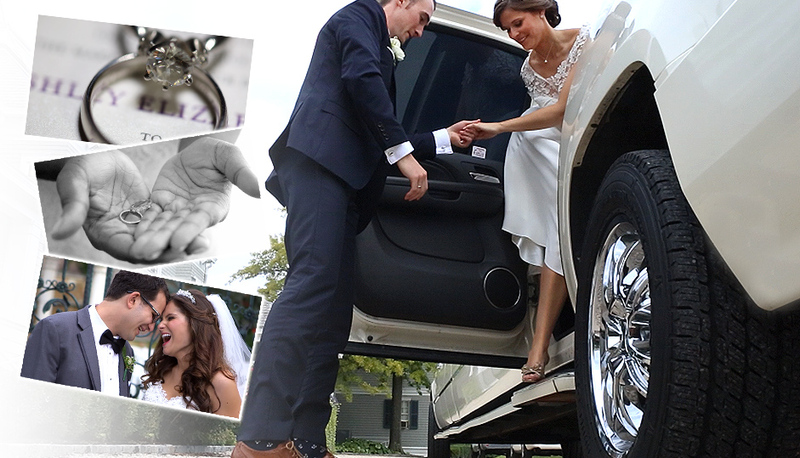 He was able to capture the major elements of our wedding, and used our music choices for the edited video. Stefan was quick to respond to all our questions, and we ended up with a video that our family and friends enjoyed watching. Thank you for capturing my wedding day so beautifully. It was a pleasure working with you, you are very professional. I would definitely recommend your services ! Stefan went above and beyond to make our day special. His professionalism, flexibility, patience, and talent sets him apart from the other cinematographers in the business. We didn't truly grasp what Stefan meant when he said we would hardly know he was there, until we got the movie and couldn't remember ever seeing Stefan or his assistant. He not only captured every important moment we wanted, but created a cinematic work of art, that we were proud to share with everyone. My sister, after seeing the finished product, has decided to use him as well. We offer our highest recommendations without reservation to all who are looking for one of the most amiable and skilled cinematographers in the business. White diamond did an awesome job! Stefan from White Diamond Videography did an amazing job at our Hindu wedding on 9/13/13 and our American Wedding 09/15/13. Stefan was professional, on time at any meetings prior to the wedding and on time the day of the wedding. He work within our budget and the day of the wedding we needed him to stay a few hours longer and it was not a problem for him. His work came out amazing . The video isn't a normal old fashion video that drags on . It was nice to pick our own songs and he created a story with it. I would definitely recommend white diamond video! What’s your favorite beverage? Can you guess ours?